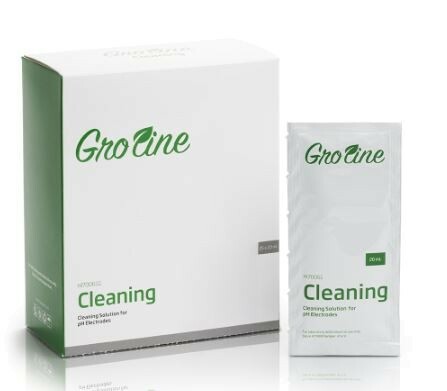 Product information "HI70061G GroLine General Purpose Cleaning Solution Sachets, 20 mL (25 pcs.)" HI70061G is a high quality cleaning solution designed with hydroponics, aquaponics, and greenhouses in mind. Specially formulated for cleaning GroLine electrodes. Cleaning is a fast and effective routine that should be performed on a regular basis as a preventative measure against using a dirty electrode and to ensure that the junction is not clogged. By simply immersing the electrode in the HI70061G cleaning solution for 15 to 20 minutes will dissolve any mineral deposits or other coatings. Related links to "HI70061G GroLine General Purpose Cleaning Solution Sachets, 20 mL (25 pcs.)" Customer evaluation for "HI70061G GroLine General Purpose Cleaning Solution Sachets, 20 mL (25 pcs.)"